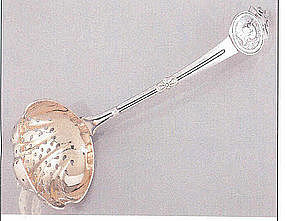 Tablespoon - Marked twice J•L in an elliptical cartouche. Mark condition Good- (Belden mark d). Length 8-3/4"; weight 2.2 troy ounces. Monogram: (script) L/MG on front and GMG/CRFC on the back. 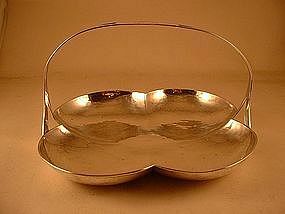 Downturned handle with rounded end, tipt on back, molded drop. Excellent condition (bowl tip mint). 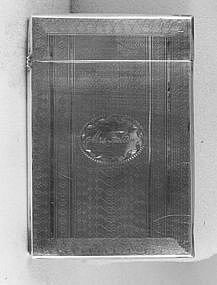 Engine-turned design on front and back, and on hinged lid. Marked on bezel with AC in a diamond and other usual pseudohallmarks. Mark condition excellent. Height 3-3/4". Width 2-1/2". Depth 1/4". Weight 1-3/4 troy ounces. The monogram is a script "Mrs. Fulton" in a reserve on the front. Minor dents, condition otherwise excellent. Hand made. Hammered finish. Four lobes, fixed handle. 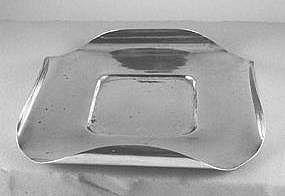 Square 9", with four lobes; height to top of handle 5-7/8". Weight 16 troy ounces. No monogram, but a small reserve on the top of the handle for one. Overall condition is excellent. 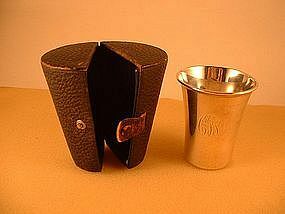 Small beaker (julep cup) in original leather case. Flares out with applied molded band at top; leather case with snap and blue cloth lining. Marked with Meriden Brittania Co. logo/STERLING. Circa 1900. Mouth diameter 2-5/8", base diameter 1-11/16".Weight 1.17 troy ounces. The monogram is a script CJS. Overall condition is excellent. 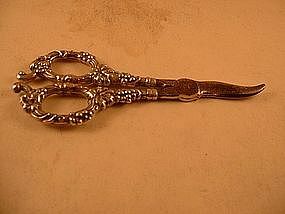 Chased design, elaborate piercing, fold-over handle. Maker's logo/STERLING; I can't identify maker. Maximum horizontal dimension 5-7/8". Outside diameter of strainer 3"; inside diameter of strainer 2-5/8". Base diameter 3". Total weight 3-3/4 troy ounces. No monogram. Overall condition excellent (holder needs regulating). Handle marked twice STERLING. Marked on steel at hinge K.C.SEELBACH CO. GERMANY. Repousse grape design handles. Length 6-1/2". No monogram. Some tarnish on blade, otherwise excellent condition. 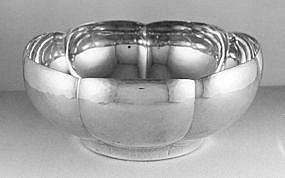 Silver gilt, chased, shaped bowl with lip. Length 7-1/4". Weight 3.3 troy ounces. No monogram. Condition, including mark, excellent. 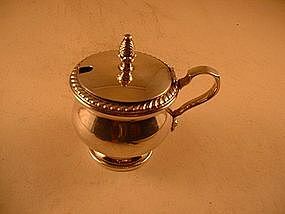 Mustard pot by Watson Co.
Hinged lid with pineapple finial, spoon cutout, applied molded ring base, cobalt glass liner, single scroll handle. Marked with Watson Co. logo/ STERLING/W333. 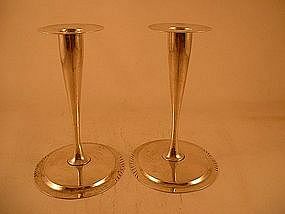 Height (to finial) 3-1/2"; maximum horizontal dimension 3-1/2". Weight 3.4 troy ounces. No monogram. Overall condition and mark condition are excellent. Marked: [Gorham logo] PAT.1864 TIFFANY&CO. 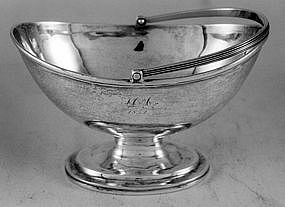 STERLING (see p. 51 of Soeffing's "Silver Medallion Flatware"). (Made by Gorham, retailed by Tiffany). 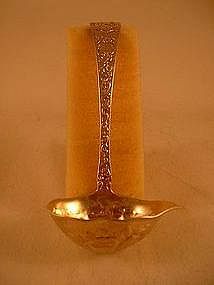 Gold wash on bowl. Fluted, length 8". Weight is 2 troy ounces. Script monogram on back of handle: Bonnie Lynn/3-26-63. Overall and mark condition are near mint. Elliptical bases with cut designs on two edges. See Ulehla's "The Society of Arts and Crafts, Boston Exhibition Record 1897-1927" for Daniel Reese in 1927. 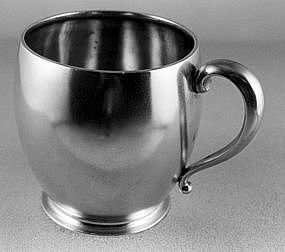 He is listed in the 1930 census of Boston as a manufacturer of silverware. Height 6-1/8". Base length 4-1/2"; width 3-7/8". Bobeche diameter 2-1/2". Weight 12 troy ounces. Marked Reese (in a cartouche)/STERLING (in an ellipse). No monogram. Overall condition and mark condition excellent. Conves; satin finish; applied molded base; single scroll hollow handle. Marked TIFFANY&CO/1466/QUALITY 925 1000/5143/m (1865-1870). Height 3-1/2". Diameter of mouth 3"; of base 2-3/8". Weight 5.9 troy ounces. The monogram on the front in Old English is: Julia (could be erased). Overall condition is excellent. 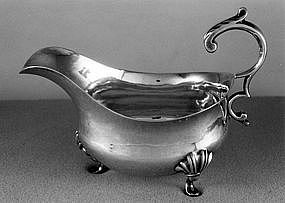 Swing handle, boat shaped, molded applied elliptical foot. Marked N.YORK/E&S/BALL TOMPKINS&BLACK, the first two lines in rectangular cartouches, the third in a curved banner. Made by Eoff & Shepherd, retailed by Ball Tompkins & Black. 1852. Length 6-1/8". Width 3-7/8". Height to top of handle 6-5/8"; height at ends 3-7/8". Weight 6-3/4 troy ounces. Sht monogram is a script LDC/1852 (not sure of the D in mono). Overall condition is excellent. 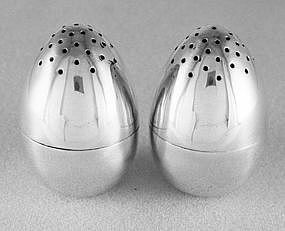 Egg-shaped; threaded. Marked [Dominick & Haff logo]/STERLING. Height 2-3/8". Diameter 1-1/2". Weight 6 troy ounces. No monogram. Overall condition is excellent. Hammered finish, single scroll hollow handle. Height of handle 3"; of body 2-7/8". Diameter of mouth 3"; of base 1-7/8". Weight 5.1 troy ounces. No monogram. Excellent condition. 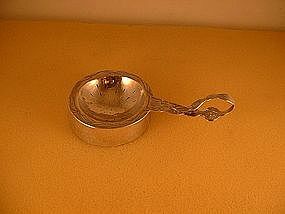 Hinged lid with spoon cutout, finial; single scroll handle. By Dominick & Haff, New York, circa 1882. Height to top of finial 2-1/4". Maximum horizontal dimension 3-1/2". Width 2-3/4". Weight 3-1/2 troy ounces. No monogram. Overall condition is excellent. Seven lobes. Rim turns inward. Circa 1925. Diameter 7-1/4". Height 3". Weight 13.3 troy ounces. No monogram. Overall condition is excellent. Square, sides rolled up. Length and width 8-3/8"; height of edges 1-3/8". Weight 11-3/4 troy ounces. No monogram. Overall and mark condition are excellent. Three hoof feet; upturned double scroll handle. Maximum horizontal dimension 6-1/4". Height of handle 4-3/4". Weight 9-1/4 troy ounces. The monogram on the side is M A C. Marked [KFL logo] /STERLING/96. Overall and mark condition are excellent.